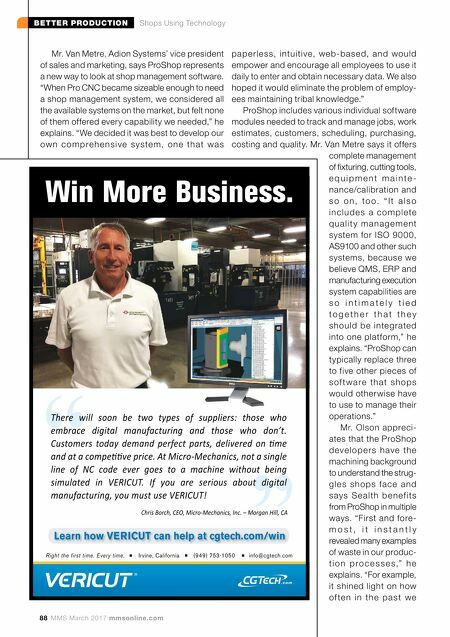 BETTER PRODUCTION Shops Using Technology 88 MMS March 2017 mmsonline.com Mr. Van Metre, Adion Systems' vice president of sales and marketing, says ProShop represents a new way to look at shop management software. "When Pro CNC became sizeable enough to need a shop management system, we considered all the available systems on the market, but felt none of them offered every capability we needed," he explains. "We decided it was best to develop our ow n c o m p r e h e n s i ve s y s te m, o n e t h a t w a s pa p e r l e s s, intu i ti ve, we b -ba s e d, a n d wo u l d empower and encourage all employees to use it daily to enter and obtain necessary data. We also hoped it would eliminate the problem of employ- ees maintaining tribal knowledge." ProShop includes various individual software modules needed to track and manage jobs, work estimates, customers, scheduling, purchasing, costing and quality. 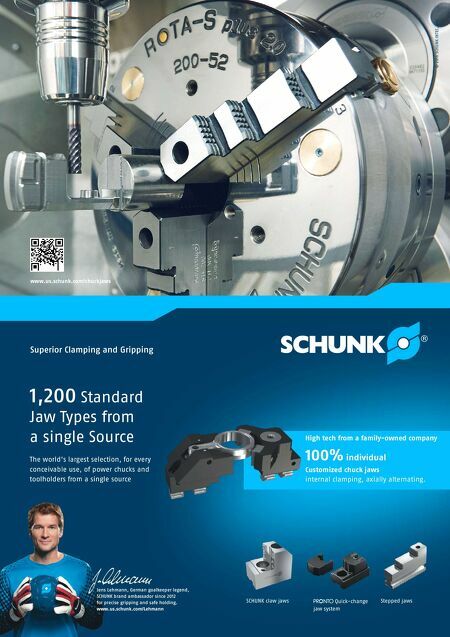 Mr. Van Metre says it offers complete management of fixturing, cutting tools, e q u i p m e n t m a i n t e - nance/calibration and s o o n , t o o . " I t a l s o i n c l u d e s a c o m p l e te q u a l i t y m a n a g e m e nt system for ISO 9000, AS9100 and other such systems, because we believe QMS, ERP and manufacturing execution system capabilities are s o i n t i m a t e l y t i e d t o g e t h e r t h a t t h e y should be inte grate d into one platform," he explains. "ProShop can typically replace three to five other pieces of s o f t w a r e t h a t s h o p s would otherwise have to use to manage their operations." Mr. Olson appreci- ates that the ProShop d eve l o p e r s h ave th e machining background to understand the strug- g l e s s h o p s f a c e a n d s ay s S e a l th b e n e f i ts from ProShop in multiple ways. "First and fore- m o s t , i t i n s t a n t l y revealed many examples of waste in our produc- t i o n p r o c e s s e s ," h e explains. "For example, it shined light on how of te n i n t h e p a s t we .com " "